Yep, it's cookie dump time. 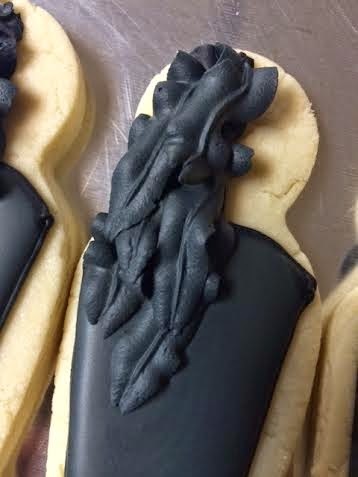 I don't have a ton of photos of these cookies - that's why they're going into the cookie dump category. Not enough to make up their own post, but too cute to not share. So enjoy a few of these. And hopefully they'll brighten your day. Even if it's just a little bit. It's Art. Really it is. It's an art kind of day. Especially for a birthday party. 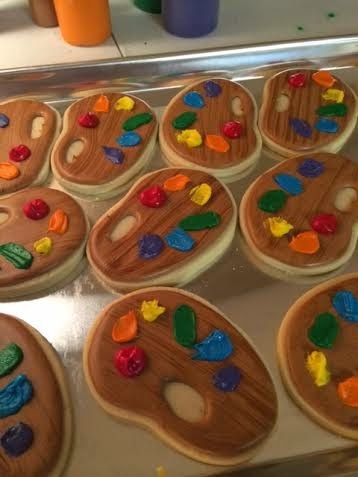 I've always wanted to make art pallet cookies and my wish came true last week. A sorority sister of mine who I've also made cookies for in the past asked if I'd make art cookies for her little girls birthday. And who can say no to that? I started out by making the art pallet out of the same cutter I've used recently to make the golf green holes. Recognize it? 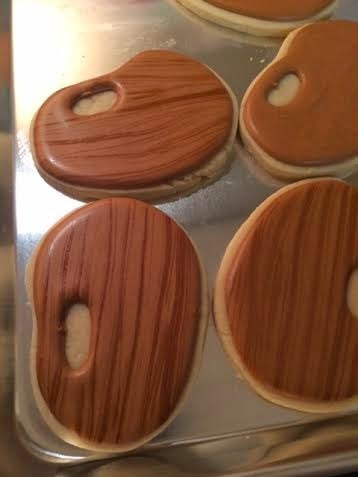 After flooding it brown I painted on the "wood grain" effect to make it look more like an artist paint pallet. I think it looks pretty nifty. 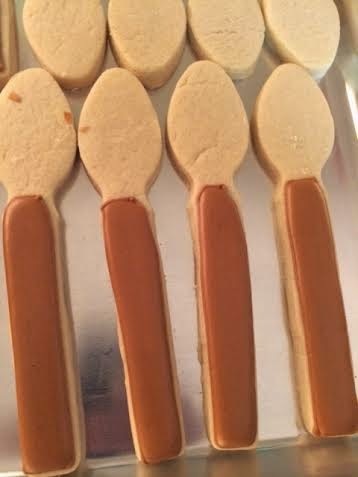 My next quest was to find something to make paint brushes out of....nothing like a spoon cookie cutter to come to the rescue. 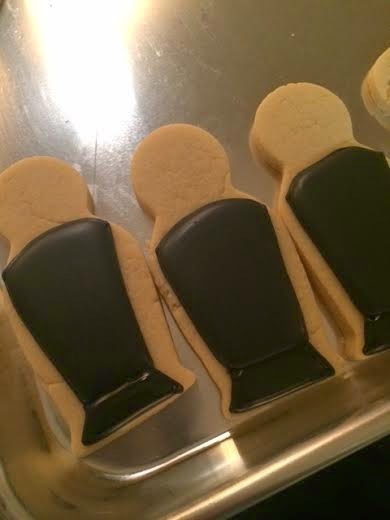 And yes, I have a spoon, fork and knife cookie cutter. Don't judge. 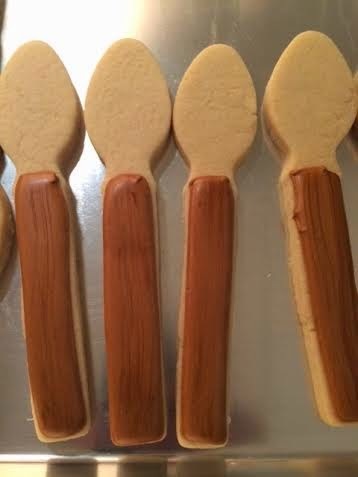 And a little wood grain effect to complete the paint brush handles. 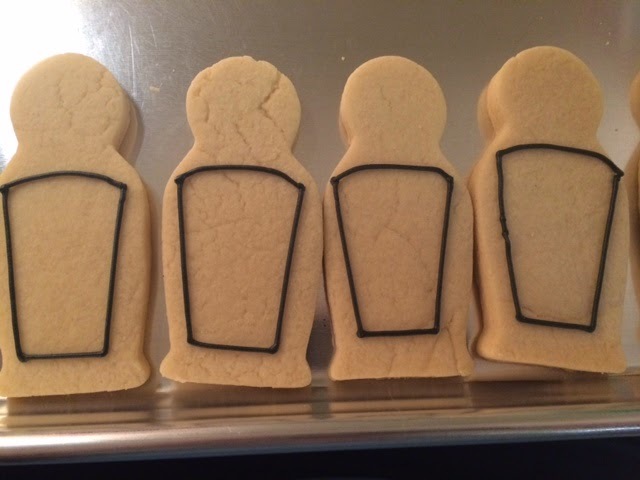 This was by far the easiest cookie decorating I've done. I just took the piping tips off the bag and smooshed (it's a technical term) the frosting onto the paint pallets. The final products are awesome. And so colorful. It just makes me happy looking at these paint brushes. Happy 6th Birthday to a cool little girl. I'm hoping she loved them! I know I did. 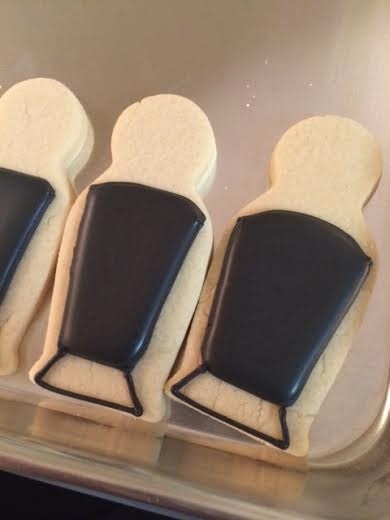 I was contacted about making some cookies for a lady who's nephew was headed off to West Point. Not West Point, Nebraska...theeeee West Point. 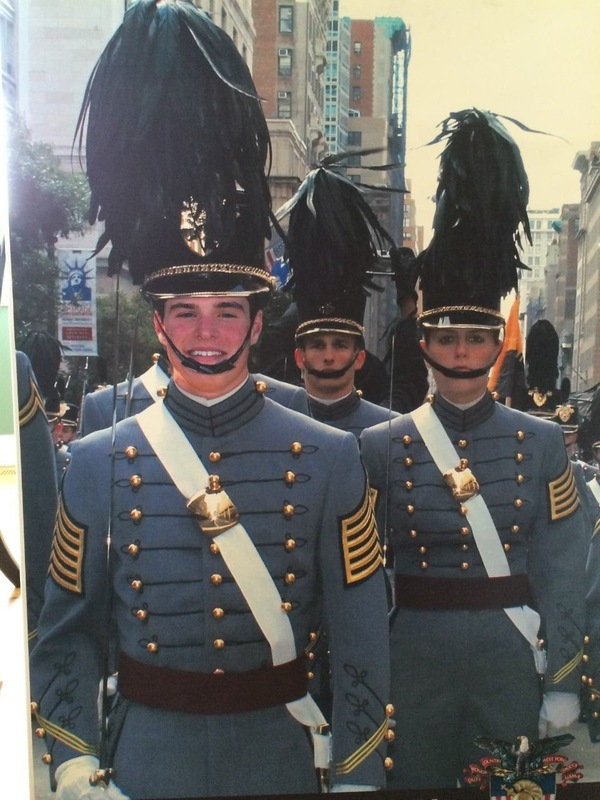 She sent me the West Point logo and also a funny picture of her nephews head superimposed onto someone's body in West Point regalia. First off...there was no way I was attempting to recreate the West Point logo. Let's be honest. That's just crazy. So I asked if I could do an interpretation. Thankfully they said yes. Could you imagine if they said no? Ha! The headdress was the part I was most excited about. I took the biggest Russian nesting doll cookie cutter and outlined the top of the hat. They ranged from "a mistake" and "ursula from the little mermaid" to "elvira" and "toothless." I had to look up what "toothless" was...FYI it's a cartoon character. I'm so out of touch. But it's just the feather plume. Then came adding on some gold accents - as the hat band. Isn't that color just great? 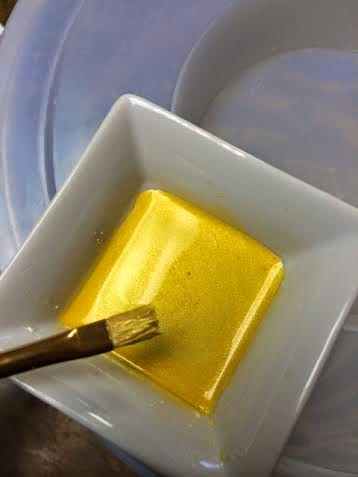 It's the gold from TruColor. Visit them here to see all the awesome natural food coloring options. Such. Beautiful. Colors. So the final product looks pretty cool. And paired up with my "interpretive" crests....it's one awesome military cookie package. But the real thanks goes to Gus who's heading off to West Point soon. Thank you Gus for what you're about to do. It's people like you who make this country great. Everyone has a favorite food. Everyone. Well, I have a favorite caterer. Yeah, I go big. One favorite thing isn't enough. Kidding. Only kinda. I do have a favorite caterer. And they're awesome friends too. You see, I have a real job. One that doesn't involve cookie making believe it or not. I'm an event coordinator. And I love my job. Especially when I get to work with great people. And it makes it that much better when one of those groups of people is the crew from Attitude on Food. Not only do they continually make me look good at my "real job" but they are INCREDIBLE supporters of this cookie addiction I have. They may be part of the problem. Sure, I'll blame them too. Because it can't just be all my fault, right? 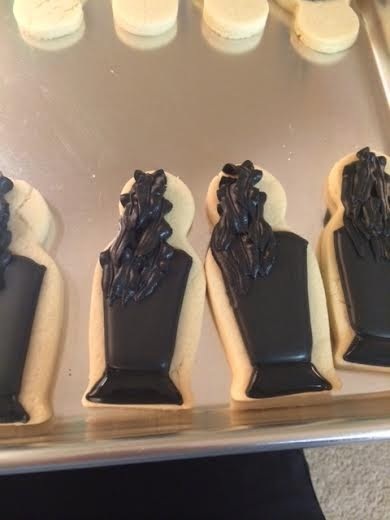 So to thank them for their support, and feeding this addiction, I made them some cookies. A few chef coats....and just some ones with funny comments. Some personal jokes, others with funny things dealing with food and a few randoms thrown in for good measure. So thank you AOF for being awesome. And being my friend. And all that other mushy gooey stuff that reminds me every day why I do what I do. In both my real job and my pretend one. Everyone has a pair of regal royalty shoes, right? Well you should. Especially if you're Mrs. Great Plains International - Maggi Thorne. She's pretty nifty. Especially since she married a friend of mine from way back. I still call him Freddy...it's a hazard of knowing him when we were in the 7th grade. However, I think he prefers Fred. He has an amazing wife and she asked me make some cookies to take on a trip. Her only request was that it have a pair of black tennis shoes to represent her charity's logo...Soles4Souls and a tiara. No biggie right? Think Chuck Taylor black shoes with a silver sparkly crown. It'll be easy, yeah, easy. 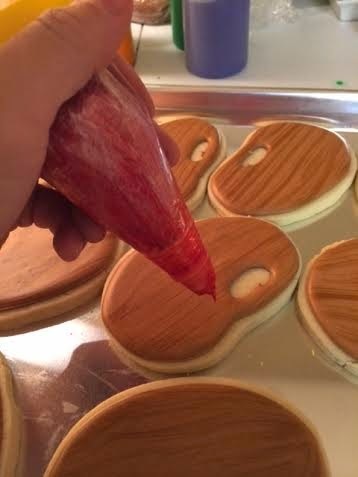 I had to have Dave make me a shoe cookie cutter. Can you believe I didn't have one. Yeah, me either. I did however have a crown cutter. So I used both the shoe cutter and the crown cutter together, did a little smooshing, and ta-da, a miracle! Below you can watch them come together. 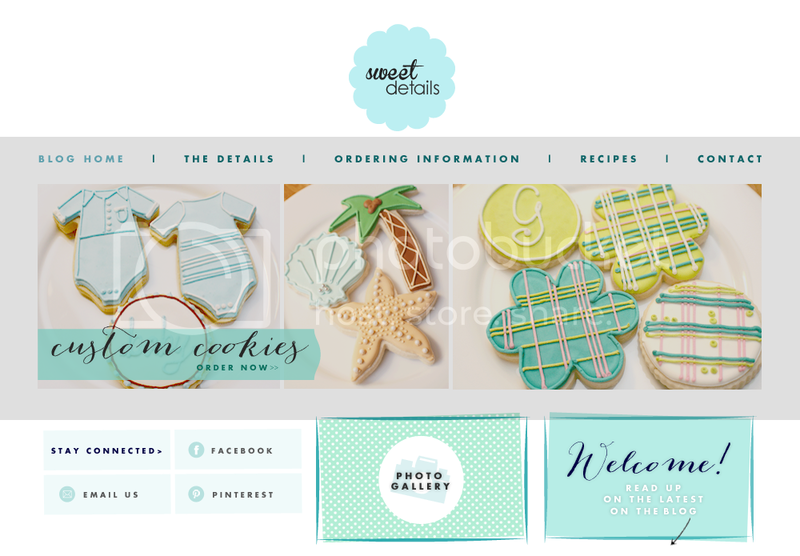 I'm happy to say it was a really fun cookie project to work on . The finished product is just what I saw in my head. How often does that happen? Ummm...almost never. 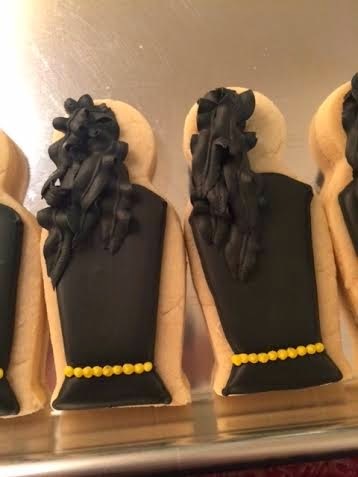 And what makes these cookies even better is the amazing organization they represent...Soles4Souls. Check them out here if you want to learn more and see how you can help. It's as easy as a pair of your old shoes. Literally. I'm not kidding. So Mrs. Maggi Thorne - Great Plains International 2014, you are one amazing and inspiring person. Thank you for asking me to make cookies. I had a great time doing it. And I hope everyone had a great time eating them! P.S. - Want to learn more about Maggi? Check out her website here!